This is captivating music – exciting, surprising, moving – it doesn’t let go. The ethos of Austrian Edith Lettner‘s music demands an open musical landscape of creative ideas free of stylistic limitations. 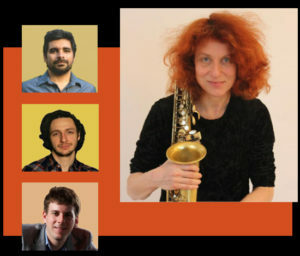 Her New York quartet Edith Lettner Jazz Heart is comprised of like-minded, musicians dedicated to playing original compositions. 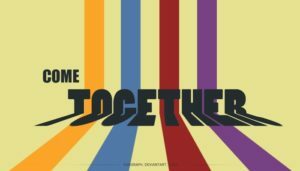 Their complex music and harmonies are simultaneously juxtaposed with atonal melodies and solos, and rhythms vary over a wide spectrum both within and between compositions in what Lettner describes as “groove creations”. 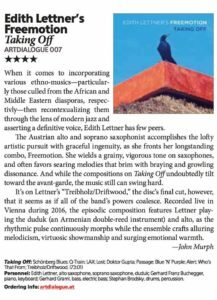 Jazz Heart will play tunes from Edith’s latest, and much praised album, TAKING OFF, (recorded with her European jazz ensemble, Freemotion). New compositions by Lettner and other band members will round out the set. This entry was posted on September 1, 2018 by Sohrab Saadat Ladjevardi.